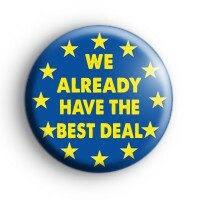 Blue, and yellow Pro Europe Flag Badge with the slogan, We Already Have The Best Deal! Britain Voted to leave the European Union but you can let the world know you voted to Remain & are not part of the leave campaign. Are you unhappy and disappointed with the result of the recent EU Brexit Referendum & want to Remain part of Europe then you need some Pro EU Badges to show your support for a peoples vote. And to also show your disappointment for how the government has handled themselves during this whole political process.